Now that we know Apple Watch will take pre-orders at the beginning of next month for a later release date in April, interested users may want to have a better idea of just how big or small given Apple Watch models are. Rounding the numbers, 42MM is 1.65 inches, and 38MM is 1.5 inches. 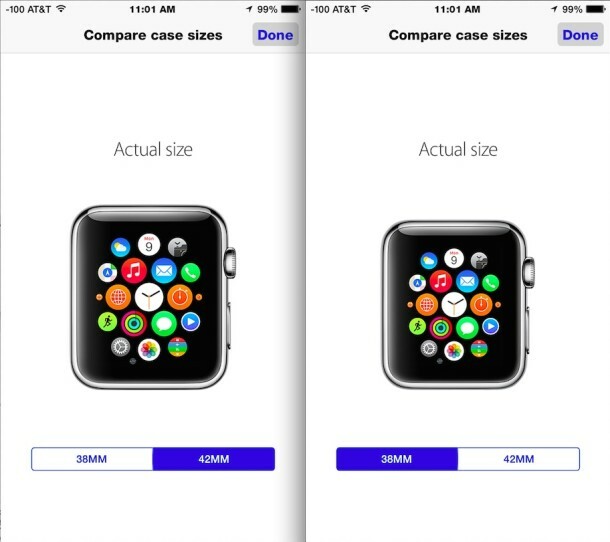 For most of us, hearing 38mm or 42mm means just about nothing, but the Apple Store app has a really handy feature that displays the actual size of each Apple Watch model, giving you an excellent idea of the exact physical size of the device. You’ll probably want to hold up the iPhone to your wrist to get the best idea of which model to pick. While the 42MM size clearly offers a larger screen display, it also costs $50 more for the base Apple Watch Sport models compared to the 38MM. Thus not only does the size of the Apple Watch matter to fit your wrist, but whether to opt for the bigger or larger model is also pricing and budget dependent. They both share the same features and functions, though apparently the slightly larger model may have a slightly longer battery life as well. Ultimately it may be best to visit an Apple Store or reseller to try on both Apple Watch models before making a purchasing decision, particularly given the huge varieties of bands and style variations. Either way, it remains to be seen if the larger Apple Watch will have the same positive yet spoiling effect as the larger iPhone Plus does… time will tell. This is a little overly hidden in the Apple Store app given how useful it is, but thanks to AppleInsider for pointing this out. First of all the abbreviation is mm not MM millimeters not megameters, second of all inches are not valid units of measurements, 38 mm watch is 4 mm smaller than the 42 mm watch, learn the International System Of Units, it’s used by 95% of the planet’s population, no Pig Latin units. Great story Mike, tell us more about how you measure your Mike in millimeters? And what planet do you live on? Mike I just realized something great, we can call MM “Milli-Mikes” as a new unit of measurement for Planet Mike! Cool? 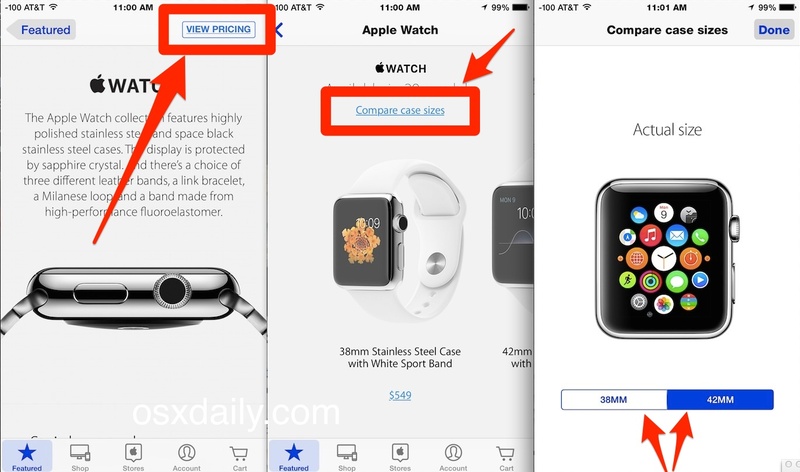 What size Apple Watch are you going to get? The 38 Milli Mikes or the 42 Milli Mikes? Wow that really typifys people in the states…you aren’t most of us as the rest of the world uses the metric system buddy! The Apple Watch is way too small. I want it available in the size of a Mini iPad strapped onto my wrist. Me too, I am strapping an iPad Pro to my chest for the time being. Go big or go home, I say. Big Texas. I want to try one, but I want to spend as little as humanly possible. I will probably go with the ladies edition in white, 38mm, maybe in black. It’s going to look goofy anyway, might as well be cheap. $349 to beta test, can’t wait! Funny how this article sates “For most of us”. Should it be “For most of us in USA” as most of us in other countries understand perfectly well the ‘millimeter’ unit of measurement- and those with a minimal level of intelligence can convert, roughly, to the antiquated ‘inches’ unit of measurement when necessary! For most people, any small unit of measurement is meaningless. Inches, millimeters, centimeters, whatever. It’s much more meaningful to see something, visual, physical, to represent the actual size of a watch. What a bunch of boehners you goobers are. You get the point just fine, you’re just being obtuse for the sake of being obtuse. The Apple Watch is the product for you. Get the gold $17,000 model, definitely, you goober. Guys, the 42mm Apple Watch is huge. You need some big thick wrists for that thing, very American, otherwise you will look like a real geek. The 38mm Apple Watch is reasonable size, but the screen size is really small so you may be squinting to read the text. So, look like a dork with a big computer on your wrist, or look like you need stronger RX lenses to read the size 2 fonts. At least San Francisco is a good font choice, certainly better than Helvetica Neue! Inches don’t mean much to me. After all we are in the 21st century with most of the world using logical metric measurements. Glad Apple have given legible dimensions (one day we will all be exclusively metric). Mike is spot on ! 😀Nick, I remember wiseguys that were blathering on about the metric system 55 years ago in high school! 😀The size of some things is ONLY meaningful in inches. 😀I crack myself up sometimes. Although the “for most of us” does seem a bit condescending, commenters who insist that the metric measurements of the watch are enough need to acknowledge that screens seem to be marketed based on diagonal inches. This is true even if other measurements on the same device are measured in mm. I admit that I don’t know about Europe, but every TV and computer screen I see sold in Asia is advertized in inches. I can confirm TV screens in England are advertised in inches. But size isn’t everything! In the UK we use both metric and imperial systems together, we buy a litre of fuel to drive at speed limits in miles per hour, our TVs are sold by the inch, drink pints of beer and buy litres of milk, eat half pounders yet buy 500 frames on meat in the shop. Anyway, back to the watch. Sell your Apple shares now, this is going to be a huge flop.